Mild strength. For the care and protection of beautiful treasured possessions. Another fine product from the polished gentlemen.This easy-to-use Silver Rinse comes with its own dipping basket, specially designed to make the cleaning of silver cutlery a simple task. Directions Simply place the cutlery in the dipping basket, making sure it is immersed in the silver rinse. Check your cutlery after five minutes and, if necessary, repeat the process until your silver is clean. Do not leave items immersed for long periods. When the cutlery is clean, rinse it in running water, then dry and polish it with a soft cloth for sparkling results. Replace when the liquid becomes cloudy. Mr Town Talk's Top Tip Always protect the work surfaces you're working on, and read the caution on this pack. Caution <br>PROTECT stainless steel and other work surfaces. 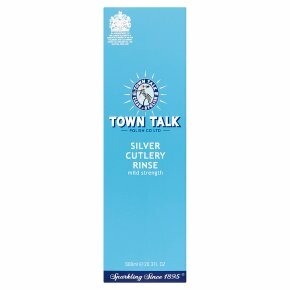 TOWN TALK Silver Cutlery Rinse is intended for cleaning silver and silver plate only. AVOID contact with stainless steel knife blades, other metals, artificially 'oxidised' silver, emeralds, coral, pearls, opals or paste stones.<br><br>Causes serious eye irritation. Keep out of reach of children. Use personal protective equipment as required. IF IN EYES: Rinse cautiously with water for several minutes. Remove contact lenses, if present and safe to do. Continue rinsing. If eye irritation persists: Get medical attention.